Oct 18. En route to Baton Rouge for my niece’s wedding, the bumper sticker on the car speeding ahead proudly proclaimed, “La Nouvelle-Orleans, c’est chez nous”(New Orleans is home).” In the local vernacular, my immediate and emotional response is “Yeah, ya right.” There just ain’t no place like N’Awlins. Memorialized in song and literature, this land of bayous and swamps seduces the unsuspecting stranger. Nestled at the crescent of Mark Twain’s mighty Mississippi, New Orleans is a contemporary American city flavored with European-Caribbean charm, evocatively and romantically described in the writings of George Washington Cable, Lafcadio Hearn, Alice Dunbar-Nelson, Kate Chopin, Tennessee Williams, William Faulkner, Truman Capote, Walker Percy, John Kennedy Toole and Anne Rice. It’s a city with which I’ve had a longstanding love affair, a mistress that I’ve kept at bay but can’t make an everlasting commitment to. No matter where I’ve traveled and lived, my cultural DNA is indisputably New Orleans. There is no escape. My African-American, Catholic, Creole identity is inseparable from the city. From the softness of my voice with its peculiar accented speech to my love of Cajun and Creole spiced food, there is no denying my southern Louisiana roots. Jambalaya, crawfish pie and file gumbo define the region’s distinctive culinary arts as do shrimp and grits, trout amandine, stuffed mirlitons, (alligator pears) and the popular oyster po-boy. Good eating and fine dining was very much part of this last trip to the Crescent City. 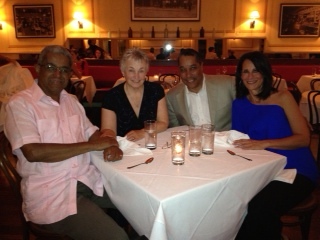 My younger brother, Warmoth, and his friend, Laurie, treated us to dinner at La Petite Grocery on Magazine Street, a new restaurant for Melanie and me. And the meal did not disappoint. Particularly noteworthy were the apple and celeriac appetizer with roasted pecans, fresh herbs and asher blue; the shrimp and grits and the shellfish stew. The food so satisfied our palates that Melanie and I returned the next day for lunch. She ordered another apple and celeriac salad, and I, a shrimp roll that rivaled the lobster rolls of New England. Eating in New Orleans is like being a child in a candy shop; so no visit to the city is complete without a po-boy. With my sister, Cynthia, we feasted on po-boys at Acme’s, a neighborhood restaurant on Veteran’s Boulevard. My mother’s favorite eatery is Landry’s on the lakefront where we dined on traditional New Orleans dishes of stuffed and grilled shrimp and tilapia. And with Winston, a friend and former colleague, I feasted on a bowl of turtle soup at Mandina’s on Canal and Carrollton. The Magazine corridor in uptown New Orleans is our favorite neighborhood to stroll along. Untouched by Hurricane Katrina, this section of town with its large live oaks that cascade over the street has an Old World charm quite different from the French Quarter frequented by most tourists. 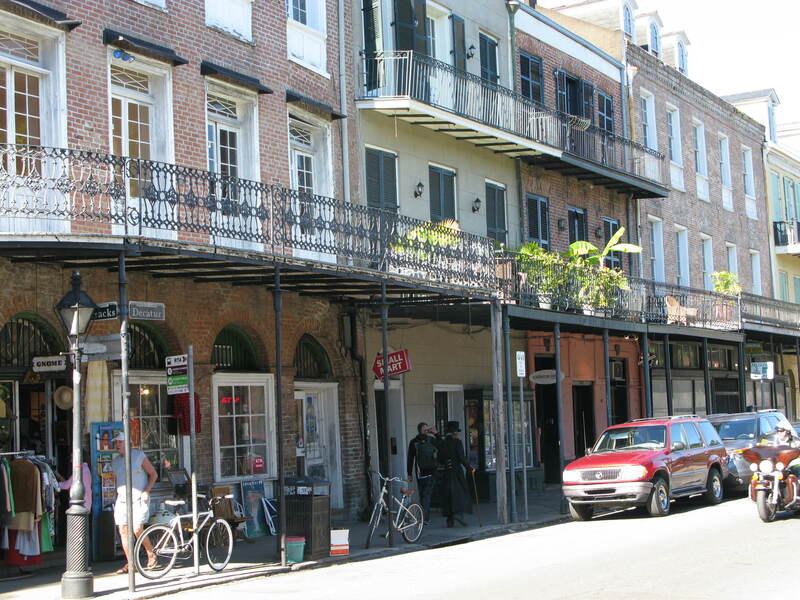 Magazine Street hums without the sleaziness of Bourbon Street. Along the street are two-story residences with wrought-iron balconies, quaint regional and ethnic restaurants, antique shops, boutiques, art galleries, salons, and mom and pop businesses that cater mostly to the local clientele who live in the blocks cradling Magazine Street. 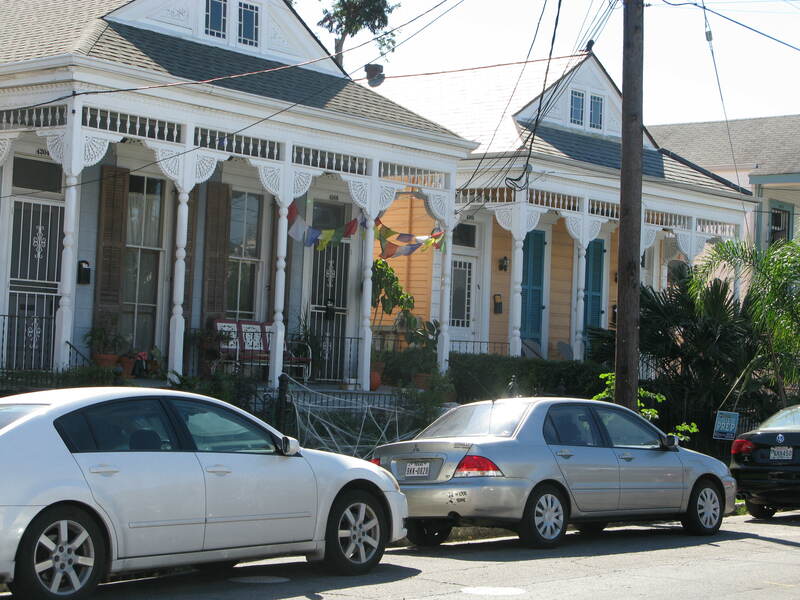 There you’ll find the shotgun houses and Creole cottages typical of the 1920s and 30s architecture. It’s been eight years since Katrina. With each visit I see progress. Prior to the great storm, the streets and sidewalks were sinking, trash was strewn about and untamed weeds in public spaces defied any lawn grooming. Katrina exacerbated the problem; and although gallant efforts by city and state government show demonstrable improvement, these eyesores still persist. Along the lakefront, in an upper-middle to modestly upscale neighborhood, where my mom moved to after selling her hurricane damaged home, the streets are so badly buckled, you’d think you were in a third-world country. Some neighborhoods still have abandoned houses; in others, large tracts of land lay barren among a few re-built homes on stilts. Many neighborhoods have little resemblance to their former existences. Some residents have not returned; some, like my mom, live in different parts of the city. But what is most startling is the large number of new immigrants, not just Hispanics who poured into the city to find work as the city struggled to re-build, but Americans from other parts of the States. Appreciating the unique ethos of this European, African, Caribbean city, they’ve come to be part of this city’s re-birth. I’m told, for example, that in a city known worldwide for its cuisine, the restaurant scene has never been so robust with the high quality of new restaurants across the city. To assure the return of the old jazz musicians, a jazz village has been constructed offering housing and healthcare. These musicians are being joined by a new generation of musicians by whom a new jazz form is being improvised to blend with the old idiom. Public education reform is slowly advancing good quality education in poor neighborhoods. And now that city government has stable and visionary leadership, economic opportunity and development promises a brighter future. Perhaps New Orleans will no longer be the city that care forgot. Yes, from its cuisine to its jazz, New Orleans intoxicates and seduces the unsuspecting traveler. So what are you waiting for? Lose yourself in this alluring land of swamps and bayous. Love New Orleans, and she’ll love you right back. Postscript: November 1. My four siblings and I are fortunate to still have with us our eighty-seven year old mother. Although age has slowed her step, she keeps active. She takes classes on subjects of interest and exercises regularly at the senior center near her home. One afternoon we met one of her teachers who eagerly let us know what an example my mother is for some of the younger attendees. I’m very pleased how well my mother has adapted to post-Katrina life. Her positive can-do spirit is inspiring. Her only disappointment is that my siblings and I won’t let her drive. She’s been fiercely independent and is not happy about relying on others to drive her places. We, on the other hand, want to assure that she remains safe to live a few more contented years. Since no male relative on either side of my family has lived beyond age seventy-nine, reaching my mother’s age is a personal goal. The singular word that best describes my niece’s wedding is grand. There were twelve bridesmaids, including the matron of honor, her older sister. Guests in attendance exceeded six hundred. Although a bishop was in attendance, (a friend of the groom’s family), the Mass was concelebrated by four priests. At the reception, my brother and his daughter danced to “It’s a Wonderful World.” Melanie and I were able to slip in a foxtrot but most of the music was meant for a much younger generation and not suitable for ballroom dancing. And though we spent ten days in New Orleans, my mother reminds us that we did not stay long. In her golden years, she misses having me near. I’m the only one, the eldest of five, to live so far away. But I’ve assured her that in my retirement I’ll have more free time to visit.